This short actuality from Edison Studios shows the street-life of New York at the turn of the century, although some parts of it may have been performed for the camera. It is hard to know what is real and what isn’t, but it obviously was meant to be taken for reality by its audience. 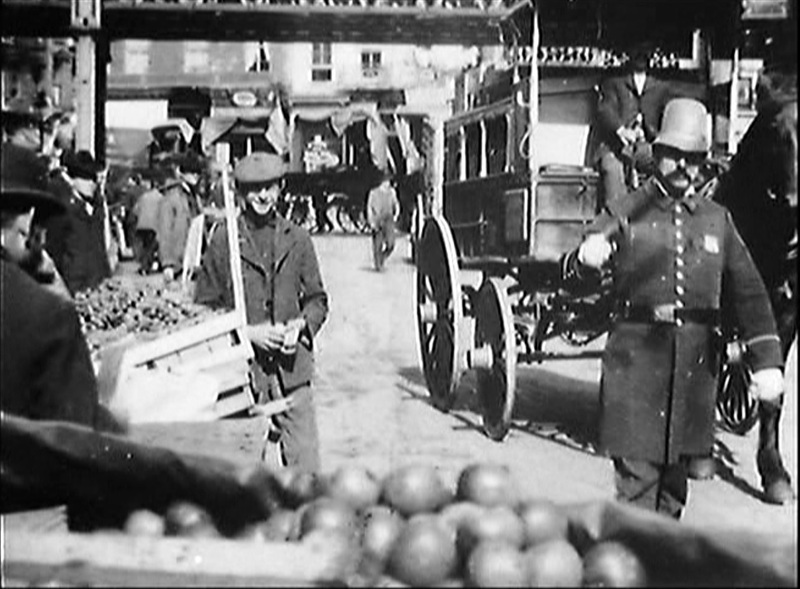 On a streetcorner somewhere near an El train track, we see a line of vendors selling fruits and vegetables from wagons. The nearest vendor is a dark man with a beard and a long, crooked nose; he seems to glare at the camera briefly. He matches, almost too perfectly, the stereotypical image of the immigrant merchant, possibly Jewish, definitely non-Anglo in origin. Near his wagon is a young urchin in a cap and shorts, casually tossing an orange in the air, and occasionally watching the camera. We watch the bustle of people on the sidewalk, and someone stops to buy some vegetables from our nearest vendor. Suddenly, a line of carts starts rolling down the street past the camera, pushed by their vendors. We soon see why: there is a policeman with a tall, rounded hat like the Keystone Cops wear walking down the street swinging his nightclub. He does not hit anyone, but just gives a “move along” type motion repetitively with it. The nearest vendors pack up and prepare to move. The cop moves past the vendors, who are now getting ready to roll out, and the boy walks in the opposite direction, still tossing his orange. I’m not sure I “believe” any of the three major characters in the movie. The vendor, the kid, and the cop all seem just a bit too stereotyped to be taken seriously. And yet, any one of them could be real, I can’t say for sure. What is real is that New York City street, crowded with food carts and busy people, with trains, streetcars, buggies, and other normal (for the time) vehicle passing along. In that sense, this is a fascinating window into the past, however contrived the plot situation may be.